Here’s the answer to the Cannot create projects or scenes – The disk is write-protected case I mentioned in my last week on the frontline post. 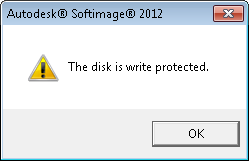 If you get this “the disk is write protected” error when you try to save a scene, it’s probably because you are trying to save your scene in the XSI_SAMPLES project. The XSI_SAMPLES folder is in the Softimage installation folder (in C:\Program Files\Autodesk), so you usually don’t have write permissions to XSI_SAMPLES. You need a project to save a scene, so create a new project somewhere where you have write permissions, for example, in your Documents folder. In the “olden” days, Softimage installed XSI in a separate Softimage folder, not in the Program Files folder it does now and these kinds of problems didn’t occur. Now I am wondering: what was the main reason for changing the installation path to “C:\Program Files\” in the first place? I think it was for standardization…so that all Autodesk products install in the standard Windows location. Are you sure you are saving the scene in the new project? I assume you can save the scene file, but now you want to export the data to some other program. The commonly used export formats are dotXSI, FBX, and Collada. It depends where you are going with the data.